The Epstein-Barr virus, or EBV, causes mononucleosis or "mono" in teenagers and young adults, but usually goes unnoticed in other people. In other groups, the virus causes no symptoms or symptoms so mild that they mimic a routine illness. Doctors find the antibodies to this extremely common virus in 95 percent of all people in the age range of 35 to 40, according to the Centers for Disease Control and Prevention, indicating that they were exposed to the virus at some point in their lives. Once individuals are exposed to the Epstein-Barr virus, whether they ever showed symptoms or not, the virus remains in some of the cells of their immune system for the rest of their lives. 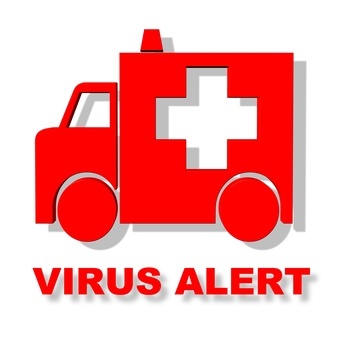 Usually the virus lingers in a dormant or inactive state, causing no problems to the carrier. Occasionally, for reasons that are not clear, the dormant virus can awaken and become active again. Although the reactivated virus will not necessarily make carriers feel sick, it will make them contagious and capable of spreading the disease. The virus spreads only through infected saliva, not through infected blood or droplets in the air, according to the CDC. Often people catch EBV from kissing or sharing a cup with an actively infected person. The CDC states that healthy infected people are the primary source of the virus and that this explains why transmission of EBV is almost impossible to prevent. Teenagers and young adults infected with EBV develop mononucleosis in up to 50 percent of cases, reports the Mayo Clinic. This debilitating condition causes fever and night sweats, headache, and extreme fatigue that can last for several weeks. When symptoms persist for more than six months after the original infection, doctors classify the condition as chronic active EBV infection, a potentially serious condition. Mainly affecting children and young adults, this rare condition can result in fatal infections due to devastating effects on the cells of the immune system, according to the National Institutes of Health. When dormant EBV activates, most healthy people show no signs. However, people who have compromised immune systems, such as patients with HIV/AIDs or those taking immunosuppressant drugs, can become very ill with mononucleosis when the virus reactivates, suffering complications that include swollen spleen, hepatitis or jaundice, anemia, or inflammation of the heart, according to the Mayo Clinic. Rarely, EBV infection can cause some forms of cancer. The Mayo Clinic explains that people who previously suffered symptoms of EBV infection, including mononucleosis, have an increased risk for Hodgkin's lymphoma, which is a cancer of the lymphatic system. Scientists also linked latent EBV infection to the development of another rare lymphatic cancer called Burkitt's lymphoma and nasopharyngeal cancer, which affects the nose and pharynx, notes the CDC. Mayo Clinic: Mononucleosis: Can It Recur?